In this episode you’ll hear the second half of a conversation I recently held about Cast Lead and its legacies, with Dr. Basem Naim. 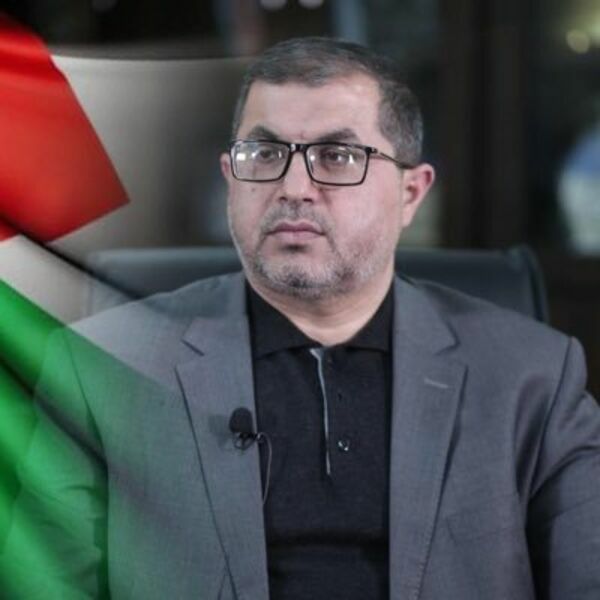 At the time of Cast Lead, Dr. Naim was the Minister of Health in the Palestinian government in Gaza. Today, he heads the Gaza-based Center for International Relations. This is the fourth episode in a special mini-series we’re releasing as part of our “Cast Lead Plus Ten” project, which started on December 27 and is running for 22 days. This project marks the anniversary of the “Operation Cast Lead” assault that Israel waged against Gaza during these same 22 days, ten years ago. In this episode, Dr. Naim discusses many of the painful after- effects of Cast Lead-- and of the tight siege that Israel has maintained around Gaza continuously since the Spring of 2006. He also discusses the notable nonviolent, civilian mass action called the Great March of Return, that citizen activists and political groups launched in March last year… and that continues to this day… an action that, Dr. Naim says, has put the issues of Gaza and Palestine firmly back on the international agenda. Speaker 1:0:01Hello listeners everywhere. I'm Helena carbon, the president of just world educational. We work to expand the discourse here in the United States and worldwide on vital issues of global peace and justice, especially in the long trouble Middle East. This is the fourth episode in a special podcast miniseries we're releasing as part of our costs lead plus 10 project, which started on December 27th and is running for 22 days. This project marks the anniversary of the operation cast lead assault that Israel waged against Gaza during these same 22 days, 10 years ago. If you are on social media, we're using the Hashtag hash costs lead plus 10 to draw together all the activities we're running on our twitter and facebook accounts, do followers on both platforms on twitter. Our handle is at just world Ed. We also have a great resource page on operation cast lead on our website, www.justworldeducational.org where you'll find links to all the episodes in this podcast, miniseries and many other useful materials. Speaker 1:1:20So do check back there for regular updates to. In this episode, you'll hear the second half of a conversation I recently held about costs lead and its legacies with Dr. bess and naive at the time of cost lead talk to him was the minister of health in the Palestinian government in Gaza. Today he heads the Gaza based Center for International Relations. In this episode, Dr Naim Discusses Many of the painful after effects of cast lead and have the tight siege that Israel has maintained again around Gaza continuously since the spring of 2006. He also discusses the notable nonviolence civilian mass action called the great march of return that citizen activists and political groups launched in Gaza in March of last year, and that continues to this day and action that Dr Name says has put the issues of Gaza and Palestine firmly back on the international agenda. This is how this part of our conversation went. Just be aware there's a little background noise in the recording. So one of the earlier interviews we did for this series was with Richard Falk and I'm actually a professor. Folk is an old friend of mine and he's a member of the, uh, of our board of just world educational. So one thing that we discussed was how often cost lead. There was a new wave of activism in support of Palestinian rights all around the world. Speaker 1:3:10So I wonder if you saw any of this happening and also what kind of solidarity you got from governments after lead. Speaker 2:3:20A lot of activists, I think 2008, 2009 was a turning point in sort of the Gaza Strip money groups founded based on this aggression, a drive to support either by coming to Gaza, mainly from Asia because after one year, after one year after the aggression, the or was open as if it was easy to come to Gusto and not for them either to bring medical, any kind of fiscal support for others, for political support, for legal support and uh, other things. But from the governments I think was very, very, uh, limited. Um, most of what came into Gaza was coordinated with this. Unfortunately, it was easy for money. Speaker 2:4:39We want to do this, but this will not allow us to allow us to hit you or to bring this is an end. All this water pumps or anything. Yeah. Most of the governments use the Israeli polices, secures for their reluctance enough to help. Uh, some of them they have tried through international buddies like who, or like ICRC or to, uh, to any to pay money for, uh, for, for, to support the gas was. But I can see most of this support was not constantly pivoting on a developmental projects was model simple, supporting on, on, on daily life needs medicine. Uh, and the, the developmental aspect was not a central part of their projects. They've been making money for our, to uh, to supply the poor families. Before today you are talking about nearly 80 to 85 percent. So as a feminist, I'm independent of integral central governance. Today I'm living below the poverty line. Without an international food aid, they wouldn't, they wouldn't thrive. Speaker 1:6:19I'm actually the population of Gaza is compared with most countries of the global south. It's very well educated and has, you know, a lot of talents. So if you could be reconnected to the global economy, the Gaza could, could maybe thrive. Speaker 2:6:40I think this is true 100 percent, but this, this is a negative at the same time, negative because when you have to agree, I'm thirsty and at the same time you are not indicated, isn't lost, just one. Sometimes it's easier for you to cope with this very dire situation, but when you are educated and talented, you will know that you can do it. You can, you can have a better life. You want on the Internet, connected with the whole world through the Internet. It is for you. You can't take a tour and there's a an engineer at the same time, you don't have something to eat. It is more sensible for them to have looked at the center. We have said that many times, we don't need any support from anyone. We don't. We don't look for food or water or support. Somebody said we don't need any help from anyone. Speaker 2:7:56Only open the door on the borders. Opened the gates of this biggest open air prison and we have very talented, educated young people and they will, they will be able to do it alone. We, we, we split the way it goes as we help put the surveys in the new thing. Money comes here. The regions fist the fist, but a coin, so apo behind even in liberal arts, I mean not people who are lazy and I think for someone to come to health, we are looking only to open the doors and leave us and we will do it more than 70 percent. So Gaza's here below 50, 51st percentile below, below 16 at the same time. It should talk about indications, maybe 90 percent for most because of educated. Speaker 1:9:09Well, I hope the usage can be lifted soon, but it would still be along a lot of work to get there. Speaker 2:9:17What the problem Helina if it doesn't. Oh, he was a man in 2006. It showed who was 16 years old. Fifteen years old is your liberation. He's going up until the change. What, what, what so called seizure mentality. It took a long time to rehabilitate the people here I was once sitting here in front of the TV and watching the zero and the, uh, they were interviewing someone for onboarding and my son, he is now 15 years old. He asked me why is this man have always been explicitly in the burglar? Is there any country in the world who have electricity for 24 hours? He wasn't that then it's countries. Well, you have 24 normal life for him is to have four or five boards. Right? This is one example of many things here which, which becomes normal. Speaker 2:11:12manifest at this because of the level of the society, a amendment, what can we do to raise our voice against this, uh, and this, and what can we do to change this situation? This took about two months discussions on facebook. What's up with the, uh, but mainly or, or professionals episcopal for sodas, activists, some of the factions here or there. Um, then, uh, defections of groups, political groups, folks that this is a good idea to raise our voices against the CS peacefully, fist to avoid any escalations, more conditions with their condition. Because the situation is unbeatable. It is. So they have that it cannot continue like this. And as I said, first, to avoid this condition. Second, to give the chance to be able to accept their feelings, the anger, disappointment, despair. Because God cannot accept to die. And Silas all to die in peace after. Speaker 2:12:44Yeah. He's more and more discussions between the injectables and activists and the Latina political groups. We have decided to take the chance of marsh, which is a, what we call it, the Berlanti based on 1960 or 76 events with six bottles scene and killed by a in his insight for data to this, and this is usually sit when he taught him about the people about this email. I have to say that from the beginning it was structured to be peaceful, peaceful, a second based on a very wide, broad national business. All political goals in indoors, activists, civil society is also participating. We, I'm going to, is only one flag, which is the ability flug nor factional flags or any other slogans. We are a filled, uh, it will be held regularly on fluoride is added to the, added to this. If we have a specific occasion like a mere 15 or so or something like that. Speaker 2:14:27And slowly the first day was a, maybe you have seen it, a very, very big participation, but a huge participation from thousands of people, men, women, children, medically, uh, from all political groups, from all activists. Civil society was a very strong tool is to the international community of insisting on using their voice demanding or corn and lifting the siege and insisting on auto sizing for a deal also that 70 percent. Right. So therefore the connection we have here today, the hail quantity of loss for retail baking, which I mean, this is a double message, a long term goal, the short term goals, long tail tail that we have to, we have that. I put it to our, to our houses, cities and villages. We, we been, we have been checked out of it, but the tip is to, uh, is to unlock the doors on this big open area to raise the boys to send the message to the whole world of suffering. And this cannot continue like this. Finally, the tour dinners peacefully protected 12 boy condition. It was the other choice was collect against the tool to accept the lord and to go into our newest condition. Or. Sorry. Speaker 1:16:44So you seem to have avoided the big escalation, but have you, do you feel that you've made any, any progress toward your other goals? Speaker 2:16:58I cannot say that we have avoided of, uh, the, the, the, the biggest escalation because there is this one. What happened been the CEO for the last year, 2015, uh, demonstrations, seniors, humblest killed thousands, one still to this day, uh, uh, they are not ready to do their obligations as an appeal playing for, I mean, took care for the pain in life with the people here in Gaza as an acute brain. But, uh, I mean, to open the borders, to allow free movement, a publicity medicine also, what happened despite of all negotiations, is the minimum of what agreed upon. Speaker 2:18:09Okay. The electricity improved a little bit, but it is a big problem with this to the fishing zone still every day they are attacking the bowls, kidnapping officials for killing them or the best, uh, each Fridays. Whites really break these demonstrations each Friday they are killing fuel and wanting dozens of him, including the last one. But that's where I'd be. And maybe you have seen it many times. If they have only one picture or one video, we're using the resistance or our actions against this a bit. This will be distributed all over the world after today. We have nothing to show the world that Athena's where a or violently attacking we're getting soldiers in most in the majority were killed for including the Friday look, the last flood we filled nine flow date. We had killed six bullets. Athenians, all of them were handled 5,200, 300, 400 meters away from the fence. Speaker 2:19:41No one of them was near the fence. Even more is near the fence. He was not threatening our board or exposing panda. Really Fret talk to soldiers even though it's electrodes and the journal and the others will feel they will be useful. Illustrators demonstrated a live for. We cannot say that we have finally and totally lift. It's a video of his coalition. On the other hand, we can see any, uh, before the Whitley Marsh, you maybe the load of Gaza, Gaza crisis and the questions in general was both on the lowest imposition on the priorities of international politics. Speaker 2:20:42The people we'll be discussing. Syria, Iran and North Korea. China, yeah. My with no one is talking and that she was able to put together a seizure goes and on the commercial community as in the table, vessel and a politics. Maybe you, if you follow this, are the, uh, what it takes most of the discussions to the Arby's on top is that is dealing with Gaza Hamas or with the funerals was, but he ended up. Must have been. It is a topic today. So politics, this is one. So again, I think the light is at least emphasized in clear words that Palestinians after 70 years, artists, we think to the implementation of the 194, you always giving people the right to return to their homes will be displeased. Uh, this is the second step internally, I think they, with your mouth was a practical example to unite the whole Palestinians, as I said, from different political groups, civil society and jewels and so on, behind one central board, which is the acute patient. Speaker 2:22:26And to teach in occupation as to end this each instead of following the internal divisions and girls instead of a struggling against each other and spending most of our energy and Internal Brooklyn's most noteworthy after Griffith with their own. Most of our energy is bent in, in, in, in, uh, in, uh, in the right direction, which is the acute patients ending their conditions in being in the future. And I think is the main thing was achieved for the price was very high, was very painful. Not Easy to lose, to be nearly 250 seniors. Many of them are children of some of some woman, hundreds, thousands of people wounded. Many of them have Hindi Club. For Eva, it was a real high price, but we didn't have any other choice. The other choice is to die in segments before we have had two choices either to die because of absence of medicine for boys and water or a obstinance city. Older to die. Defending our freedom and dignity and coordinating for lifting the siege by these three things here have chosen the second one. If I have to die, I have a thing with you have to resist occupation. Speaker 1:24:31so that more people can hear about it. And I want to thank you very much for the uh, for the interview. Really helped. Speaker 2:24:39Thank you so much for your time and for calling me. Speaker 1:24:43Hey there. It's Helena carbon again. I hope you enjoyed that part of my conversation with Dr. Bursin name and found it informative. This is the fourth episode in our podcast. Many series on cost lead plus 10 years. You can find links to the earlier episodes in the mini series and a lot more resources in a variety of different media on our website@wwwdotjustworldeducational.org. The next episode in this mini series will be an interview I conducted recently with our director of outreach, the Veterans Social Justice activist Joe k doctrine who spent three plus years in Gaza from 2011 through fall of 2014. That one will be released on January ninth and we're lining up some fine other episodes too, so you all will have a lot to look forward to here. By the way, if you click on the donate tab on our website, you can learn about how you can help support our cast lead plus 10 campaign and the rest of our community education programs. We really appreciate any help you can give. Thanks. Stay well and tune in again on January nights.